Subzero temperatures for race setup at daft o’clock did not get much higher in the bright and sunny skies over Leverhulme at midday, but the racing was certainly pretty hot stuff! 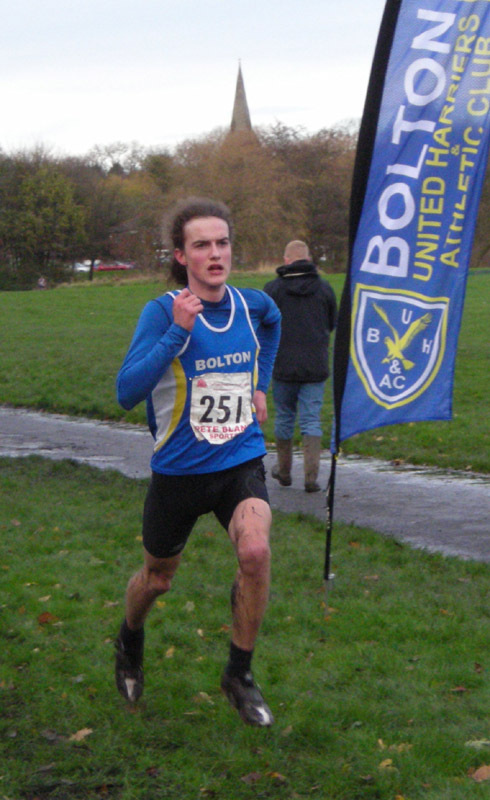 For the seniors, after the three laps and having led from the start, Bolton’s Tom Carson had to strain every sinew over the final 200m to hold off Robert Warner. 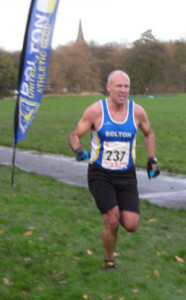 The Blackburn man managed to draw level and cue a drag race to the finish line; Carson had saved enough energy for one last final response with 20m to go, eventually crossing the line ahead by 2m, though both clocked 34:49. Amazing stuff! The result gives Carson leeway to retain his RRXC senior men’s title, requiring only a top 8 finish at Rossendale’s Marl Pits in a fortnight. Tommy Harrison’s excellent 7th place saw him leap into the series’ bronze medal position, leaving a four-way fight for the series runner-up with Dave Smith (Leigh), Tim Raynes (Blackburn) and Danny Collinge (Burnley) and the tantalising prospect of a Bolton 1-2. Behind Karl Darcy (12th), there was more certainty about the results for Declan Toomey (15th) and John Knowles (17th) – both took unassailable leads in their respective U20 and M40 categories, to clinch the Junior and overall Veterans’ titles. Phil Marsden (18th) completed the six-counter team line-up to net 65 points, comfortably seeing off Blackburn’s 120, and bag the series team trophy with one race to spare. 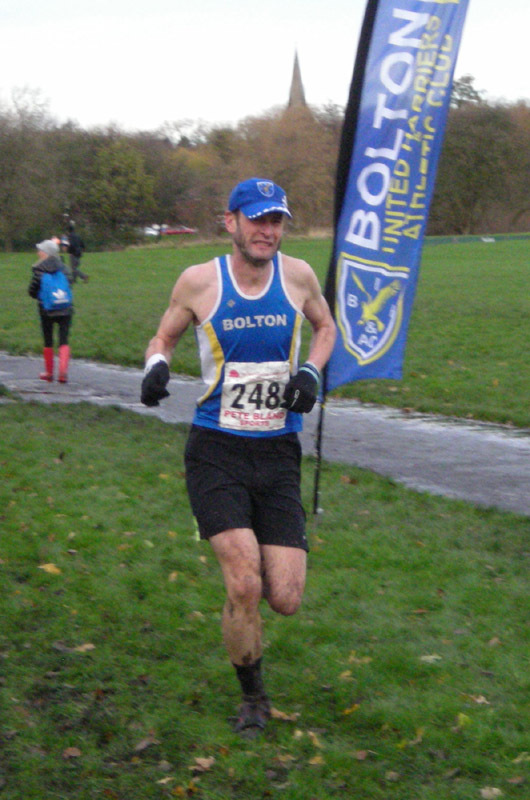 Mark Swannell, Chris Povey and Chris Pickford joined Knowles to form the Vets’ team, whose 69 points was bettered by Todmorden’s 44; only 5 points separate the two in the RRXC standings, so Rossendale will witness another heads-up battle for the title. Dean Johnson’s 48:09 followed a 6 hour stint of helping to set up the course (and probably having covered the 10.2km distance already! ), whilst Stuart Parsonson was ‘enthusiastic’ about the deeper-than-usual water crossing that claimed Tony Warham. 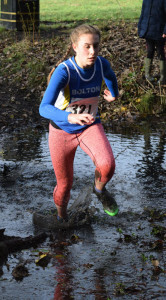 For the women, U20 Fiona Gande (44th) was again the club’s leading light, showing a clean (muddy?) pair of heels to mum Karen, who was just over a minute behind. Further back, Laura Crawley upped her pace as Sara Green was challenging in the home straight, to give a 4s gap and show good awareness. Bolton’s juniors experienced a few ups and downs, literally, as slips and slides in the mud took their toll across the age-groups. It began with the U11 boys, where Harvey Kenny’s stumble down the ‘golf’ slope allowed Oisin Behan to overtake and the intra-club seesaw for RRXC supremacy between the two tipped back towards Oisin; Harvey’s determination was evident though as he battled back to keep the gap to just 9 seconds. 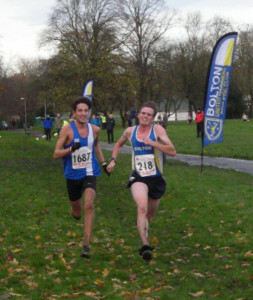 Home territory saw 13 Blue Vests – Bolton’s largest representation yet, with Liam Allison and Finn Coop embodying the team ethic. For the girls, Izzy Merritt set the early pace which yielded a fabulous second place; she is in pole position for the age-group title, though with Clayton-le-Moors’ Ella Dorrington only 1 point behind, it promises to be close. Idowu Taiwo bookended the team with excellent spirit and resulted in a second-place behind Wigan by the narrowest of margins. 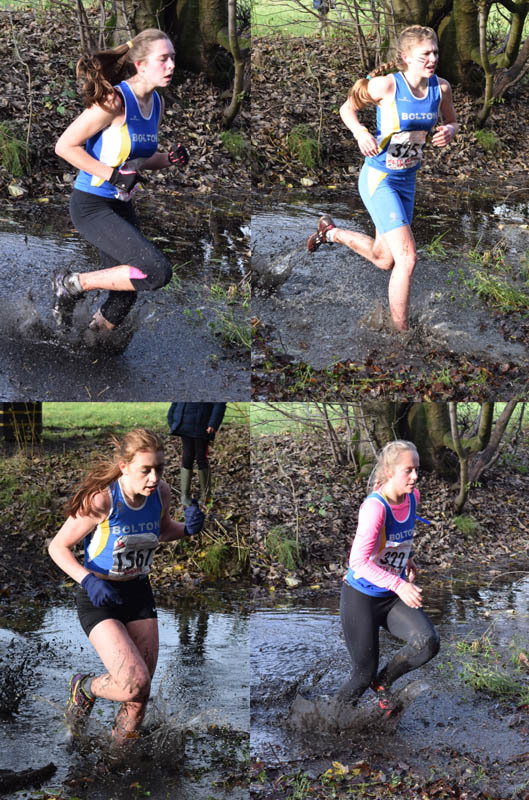 Ruairi Behan (12th) and Ella Richardson (29th) were Bolton’s leading counters for the U13s, whilst Madeline Erzan-Essien (9th) led the U15 girls. In the U17 age-group, there was more drama as Rachel Bailey caught and battled it out with Katie Oakley. Similar to the situation Carson would find himself in an hour later, the last 150m saw both Bolton girls sprinting shoulder-to-shoulder. Come the final 25m, a combination of exhaustion, off-balance posture and arms tangling in the jostle for the line resulted in Oakley falling to the ground and Bailey taking third. Part-and-parcel of the x-country game, both saw the funny side in the end and will learn from the experience. Mercedes Mercer and Georgia Greenhalgh completed the team. 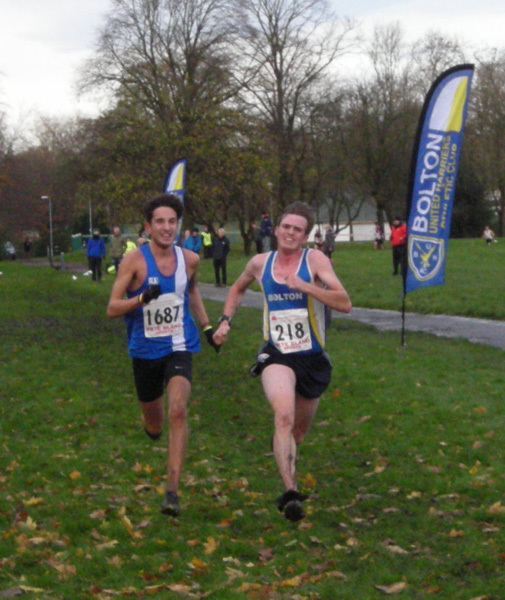 Elsewhere, two stunning performances came at the Chorley Fire Fighters 10K. Tony Valentine, road-racing for the first time as an M40 veteran, turned in his quickest time for nearly 3 years, winning in 33:10. Also on the podium as third of the 409 field, M45 Simon Dally smashed his PB by over a minute to clock 34:27. Stupendous!